Meet 2019 NC REALTORS® President Asa Fleming. Born in New Haven, Connecticut, Asa lived in New York City and went to high school in Wilson, N.C. After graduating from NC State University, Asa returned to New York City, where he began his real estate career. Eventually finding his way back to North Carolina, Asa currently lives in Raleigh with his wife, Tangie, two children, Deuce (Asa II) and Alexis, and their dog, Holly. As the incoming president of NC REALTORS®, Asa is looking forward to collaborating with epic NC REALTORS® who have the backs of their clients, community and industry. “I have learned from the excellent examples of past leadership that volunteerism is what makes our association effective,” he said. Other initiatives Asa has on his agenda are boosting RPAC investments through the Young Professionals Network (YPN), diversifying leadership across the state and increasing our exposure at the national level. What are your hobbies or favorite pastime? I love to travel, spend time with my family, read and play chess. What is your favorite app or technology device? I love watching YouTube on my phone. It is so nice to have so much information right at my fingertips. I love perusing Realtor.com as well as playing chess on it, too. What about Podcasts, TV Series or Books? Any favorites? I chose real estate as a profession because I wanted to make my own way in life, and help people find shelter for themselves and family. I also wanted to educate others on the importance of owning a home in America. Tell our readers about your current company? I work with Allen Tate REALTORS® and love their slogan “We are Home.” The leadership as well as the fantastic REALTORS® there have treated me like family and have been very supportive. I appreciate them giving me the opportunity to conduct business with their company. Our association slogan, “Be Epic. Be an NC REALTOR®,” emphasizes the super-human qualities that make NC REALTORS® so epic. Like superheros! What would your REALTOR® superpower be? Our association slogan is a true depiction of what being a REALTOR® is all about. REALTORS® advocate for their clients, community, industry and each other. They care about educating the consumer, and protecting the right to own private property. Going above and beyond is a characteristic of a REALTOR®. The commitment and dedication is tremendous and is an example for other industries to follow. And, my superhero power would be the “Advocator”. Any other key notes about your life or career? I am always seeking to give back and increase my awareness. I’m vice chair for Southeast Raleigh Promise, an organization that believes in the promise of the people of Southeast Raleigh and works with other partnerships to enhance the quality of life in Southeast Raleigh. I’m a founding board member and treasurer of Central Wake High School, a charter school that focuses on dropout prevention and gives students a second chance. I serve on the board of The Carying Place, which is a nonprofit that help homeless people learn how to manage their finances and secure housing. I also serve on the Wake County Planning Board. What is one characteristic you think every leader should possess? Emotional intelligence is a must if you are a leader. Having the ability to control and direct feelings and emotions to ensure the best outcome and results is key. Is there any memorable leadership advice that you’ve received in the past and want to pass along today? You can only keep what you give away. Give first before you receive, and do not think about receiving. You have to breathe out to breathe in to stay alive. It is a play on words in that the association supports REALTORS®, and the REALTORS® have their clients’ backs as well as their community and industry. It serves as an acronym as well: Building on the past leaders of the association; Advocating in the present for property ownership, private property rights and our industry; Creating a future with a multitude of diverse engagement and ideas, will be the Key to our success. Now that you are president, what kinds of opportunities do you find promising and which do you wish more NC REALTORS® knew about or would help support? I would love to engage diverse groups to lead our association into the future and to help influence the public policies we advocate for at the General Assembly. I also want to increase participation in RPAC by educating as many REALTORS® as possible on the importance of investing in their business. Is there an obstacle or problem that you find REALTORS® facing today that you’d like to work towards overcoming during your tenure as president? We as REALTORS® must redefine and reshape our value proposition. With the advent of technology in our industry, as well as the various new business models entering the marketplace, we must ensure that the value of having a professional involved in the transaction, operating under a specific code of ethics, is not overlooked. Not sure if this will be done during my tenure but will definitely be helped along. Any other thoughts for our members/readers? Thank you to all members and affiliates for the opportunity to serve this association at this level. Let’s have a fantastic and extraordinary year. We need your input and ideas to flourish and prosper. 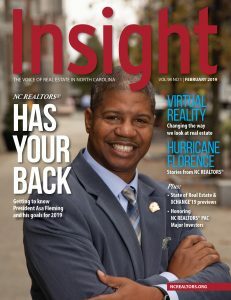 Remember, NC REALTORS® has your back!